Natural Stone Floor vs. Ceramic Tile Floor: Which one to install? Natural stone and ceramic tile floors are quite similar. They are both hard surface floors with comparable characteristics and durability range. Made from natural materials both are installed in form of tiles and demand the same level of care. Each has its own benefits and drawbacks depending on the area of installation. But which one should you choose? The strength and durability of any stone are determined by the formation process it undergoes. The stones used in flooring can be either metamorphic, sedimentary or igneous and each come with a set of unique properties and characteristics. Granite is the hardest and densest natural stone. It’s so strong that it’s even used for construction purposes. Because of its high density, stains and water aren’t a common problem for granite floors. However, it’s still advised to seal the existing pores as well as the grout lines between the tiles for better protection. Granite flooring can have different surfaces depending on the treatment process the stone went through. It can be polished smooth, honed flat, or left in a naturally gauged state. After granite, slate is the second hardest natural stone used in the flooring industry. It’s a combined material and consists of layers of flat, hard packed stone that naturally over time has been pressed into solid pieces under the weight of the earth. This makes slate a strong enough flooring material to resist cracks and breaks when in use. However, there is still a significant danger of chipping. Fortunately, it can easily be avoided with a proper chemical sealing. For the best and safest flooring experience, the sealer should be applied at least once every year. Limestone floors are less dense and strong than slate or granite floor. The reason for this is to be found in its formation process. Limestone is shaped through the natural long-term compression process of different fossils. It’s also more porous than all the already mentioned natural stone types and requires a more frequent application of chemical sealer. Over time limestone flooring starts to develop a beautiful aged look that closely resembles the image of classical antiquity. Sandstone probably belongs to the lowest class of natural stone floors. Being extremely porous it’s generally not recommended for humid environments like bathrooms. For the best result, sandstone floors should undergo routine checks and sealing procedures. The main difference between the types of ceramic tile has to do with the manufacturing method. Glazed tiles go through a more complex making process with an additional firing procedure. This gives the finished tile certain advantages over its unglazed competitor. However, both options have their benefits and should be measured only against the requirements of the environment the floor is going to be installed in. Ceramic tile is a natural flooring product made from clay and sediments that are mixed and baked in a kiln at a high temperature. This combination is usually referred to as unglazed tile. Because of porous nature, this ceramic tile is highly prone to staining and can absorb liquids easily. To avoid any of the related risks it’s highly recommended to properly seal the tile floor right after the installation process is complete. For the best protection, frequent re-seals are advised. Unglazed tiles’ characteristics might be nowhere as impressive as its competitors’ but often it’s their natural and robust look they get picked for. 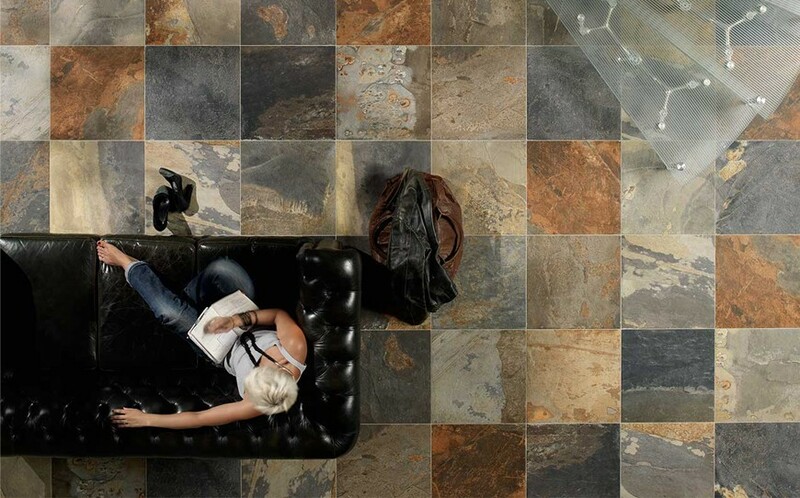 Ceramic tiles don’t only make a beautiful floor, but also serve as an impressive decorative option for your walls. Glazed ceramic tiles are made exactly the same way as unglazed, except a layer of liquid glass is added to the top of the tile giving it a more sparkling look and better resistance against spills and stains. The glaze layer already acts like a sealer so there is no need to steal your ceramic tile floor after installation. In addition, the protective layer can be printed to resemble any desired material, including even natural flooring options like hardwood and stone. The durability of ceramic tile corresponds the temperature it was baked in. Hotter klin makes stronger tile. A rougher surface makes unglazed tile better at dealing with scratches and a safer bet for moist environments where there is a danger of slipping, but the glazed option with its protective layer keeps the water out more efficiently. Natural stone also differs in strength. Because of their higher density, granite and slate floors are generally better at dealing with different irritants than marble or limestone floors. All stone floors are indeed durable but some of them can chip more than others, mostly because stones are still composite products and can have invisible faults in individual pieces. Variety is definitely an advantage when it comes to choosing a new floor for your home. While unglazed tile flooring comes mostly in rich earthy browns, glazed option offers a truly wide range of styles and colors. Even though it can mimic the look of natural flooring materials including stone, it is not fully comparable with the real thing. This lack of authenticity is why some people choose the less reliable natural option over the hassle free glazed flooring.